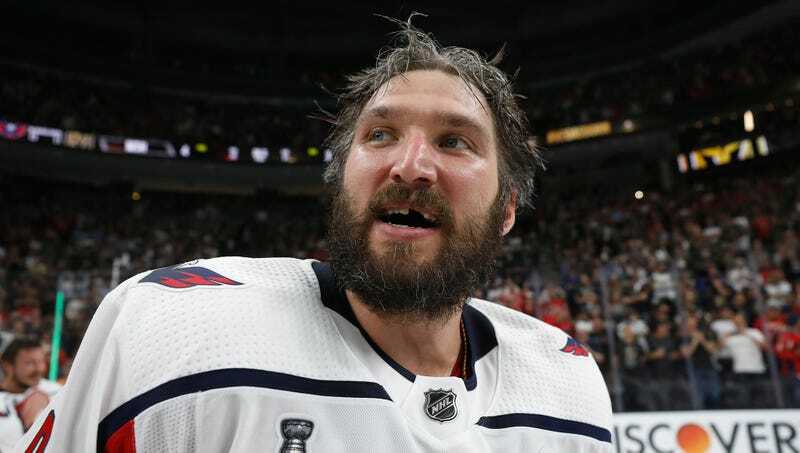 WASHINGTON—Saying the drunken exploits he managed to pull off following his first Stanley Cup victory could serve as encouragement to others, Alexander Ovechkin told reporters Tuesday he hopes to inspire athletes to successfully power through their own month-long binge-drinking sprees. “Hopefully, I can help motivate other players to keep funneling beers and pounding shots even when people start saying it’s time for them to quit—because that’s what you have to do if you want to take home that trophy one day and fill it to the brim with grain alcohol,” said the Washington Capitals forward, urging his fellow athletes to “push through” all the dry-heaving, dizziness, and headaches on the path to achieving their ultimate goal. “It’s never easy. Sometimes, you’ll be so tired you’ll want to just lie down and give up, but you have to go out there and do it again the next night, even when your body is telling you to stop. Of course, you have to train for it. No one’s tolerance starts out this high.” At press time, a bleary-eyed, barely standing Ovechkin was overheard challenging players from the Capitals’ minor-league affiliate to a game of flip cup.